Full Suspension triple butted T6 aluminium off road new style frame featuring the Bosch integral Powertube 500wh battery,teamed with Rochshox Reba RL 150mm big hit suspension fork and dialed in aggressive geometry. 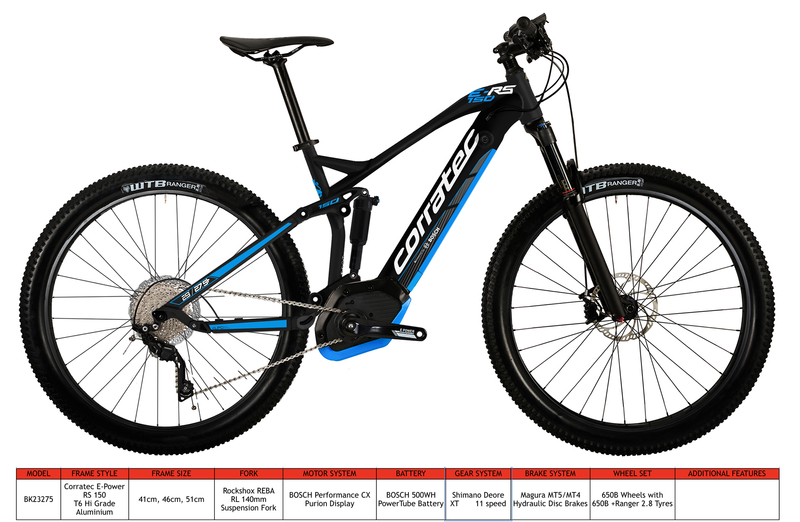 Powered by the Bosch Performance CX mid motor engine its Off-Road Performance stability is evidenced by the huge WTB 2.8 Ranger tyres and an impressive componentry list including Shimano Deore XT 11 speed gear system, Magura Hydraulic 180/180 disc brakes completes the package. Exhilarating downhill with unbelievable uphill capabilities!